Days after winning run-off election, Brazil's president-elect says he will fulfill campaign promise, move country's embassy to Jerusalem. 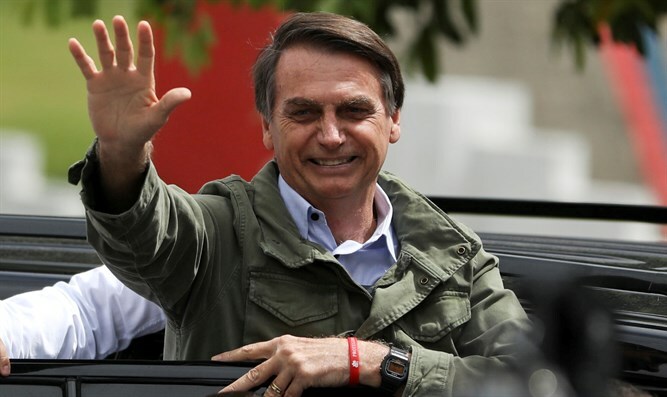 A staunch supporter of Israel Bolsonaro had vowed during the campaign to relocate the Brazilian embassy in Israel to Jerusalem, following in the footsteps of the US and Guatemala. On Thursday, Bolsonaro announced via Twitter that he intended to uphold his campaign promise. Earlier on Thursday, Bolsonaro spoke with Israel Hayom, emphasizing his support for the Jewish state and suggesting that he was inclined to move the Brazilian embassy. A former army captain and Rio de Janeiro federal deputy, the 63-year-old Bolsonaro won Sunday’s vote on a law-and-order platform, as Brazil faces an ongoing surge in violent crime. Knesset Speaker Yuli Edelstein welcomed Bolsonaro's announcement Thursday, calling the president-elect a "wonderful friend" of Israel. "A moving announcment by the president of Brazil, my friend, Jair Bolsonaro, that he will move the Brazilian embassy to Jerusalem, our eternal capital. As I already said, President Bolsonaro is a wonderful friend of the Jewish people and the State of Israel. Thank you so much, Brazil!"